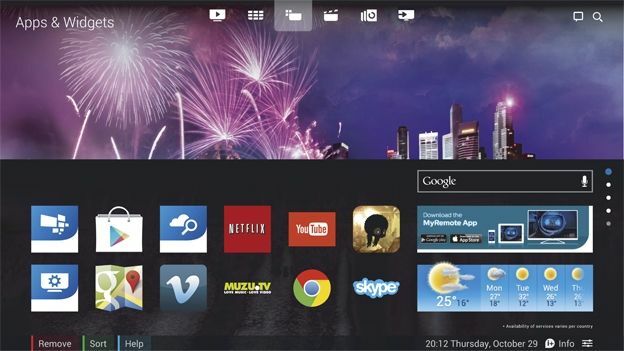 Philips has unveiled the first official image of Google Android running on a TV. The company announced this week at CES that it had chosen Android to be the operating system for its flagship Ambilight range of Smart TVs this year. The decision to move over to Google's operating system is one that comes with a few benefits, for starters Philips's new Smart TVs will have access to the entire Google Play store which means that they can download any compatible app. On top of that users will be able to then download any of the Philips Smart TV apps that are currently available on Ambilight TVs giving the new range added functionality. Gaming is also a clear focus as the new range of Ambilight TVs will come sporting 'powerful quad-core' processors making the new range serious contenders against the likes of OUYA and Mad Catz's new M.O.J.O. console. Philips has also confirmed that the move will enable better integration between mobile devices and their TVs with iOS and Android devices both being targeted. As yet Philips hasn't revealed any specific models but it has revealed that the first Ambilight TVs running Android will be available as soon as March or April 2014.